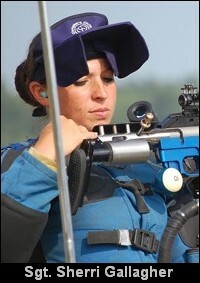 Sherri Gallagher, the 2009 NRA National Long-Range Champion, could add a High Power Championship to her list of victories, if she stays on pace. Only one woman has ever won the National High Power Championship — Sherri’s mother, Nancy Tompkins. All of Sherri’s fans nationwide all pulling for her to be the second-ever female High Power Champ. But the competition will be tough. Sherri Gallagher is beginning to pull away in the X-Count, but she could still be overtaken by any of the shooters close behind her in the standings. Carl Bernosky, a multi-time National High-Power Champion, is just one point behind Sherri. Stephen Culpepper and Eric Swearingen are still in striking distance. Ten-time champion David Tubb is not far behind either. Shooting against those male “all-stars”, Gallagher has been very impressive and looks to continue her pace, but this isn’t over just yet. This year’s Championship could go down to the last shot of the last relay. On the Service Rifle front, Eric Swearingen is in the lead for the Service Rifle Championship with a 1789-86X, but both 2009 Service Rifle Champion Grant Singley (1785-97X) and Troy Lawton’s (1785-70X) are just two points back. For the latest news from Camp Perry, including High Power Championship standings, visit the NRA Blog. Here is the “leaderboard” after the High Power Rifle Championship’s third day, with one more to go. Tomorrow’s forecast is clear and sunny with no threat of rain. Steve Clark Reports: Sherri missed 1st last year from a crossfire. This year so far she’s shooting 71.6% Xs, dropping only 3 points out of 1800. Norm Houle (last year’s Champion) apparently cross-fired today, putting himself back a good number. What a great show! Like last year, I think it’s going to come down to the last shot fired tomorrow afternoon to decide the winner. Report and photo courtesy NRA Blog. Share the post "SGT Sherri Gallagher Leads High Power Championship"